Social media have changed how governments communicate with society, encouraging participation and the interaction of citizens in public affairs. 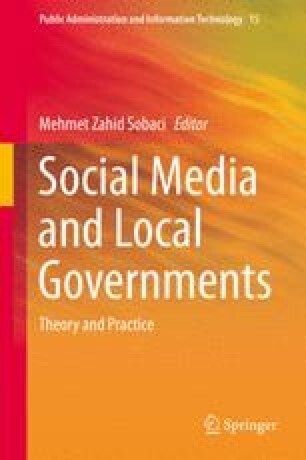 The main aim of this study is to analyse the online practices of Spanish local governments, through Facebook, to examine the factors that influence these practices and to determine citizens’ mood in this respect. The results obtained show that the popularity and virality of municipal Facebook pages are greater than their followers’ degree of commitment. Users take a positive view of the pages, and the type of information most commonly shared on Facebook by Spanish local governments is of a social nature. Factors that influence local government’s Facebook practices include the level of internet use among the population, the level of municipal debt, the number of inhabitants and the economic capacity of the population. This research was carried out with financial support from the Regional Government of Andalusia (Spain), Department of Innovation, Science and Enterprise (Research Projects P10-SEJ-06628 and P11-SEJ-7700) and FPU/2013 grant from the Spanish Ministry of Science and Innovation (MCINN). EC (2003). Directive 2003/98/EC of the European Parliament and of the Council of 17 November 2003 on the Re-use of Public Sector Information. http://ec.europa.eu/information_society/policy/psi/docs/pdfs/directive/psi_directive_en.pdf. Facebook, (2013a). Key facts. Facebook. http://newsroom.fb.com/key-facts. Facebook, (2013b). The annual Facebook emagazine. http://techcrunch.com/2013/12/29/facebook-international-user-growth/. Moreno, M. (2013). 5 métricas en social media para evaluar tu gestión de comunicación. http://augure.es/default.aspx?ID=58&TITLE=M%C3%A9tricas+en+Social+Media. National Institute of Statistics (2012). Spanish National Accounts. National Institute of Statistics. http://www.ine.es/jaxi/menu.do?type=pcaxis&path=%2Ft35%2Fp008&file=inebase&L=1. National Institute of Statistics (2013). Population figures and Demographic Censuses. National Institute of Statistics. http://www.ine.es/en/inebmenu/mnu_cifraspob_en.htm. U.S. Census Bureau (2011). U.S. & World Population Clocks. http://www.census.gov/main/www/popclock.html.